September is all about mixing sweet and savory. Plums are in season and the purple fruit is the perfect way to spice up a treat. Mature plums may have a dusty-white coating which is easily rubbed off. The naturally occurring wax coating is called wax bloom. 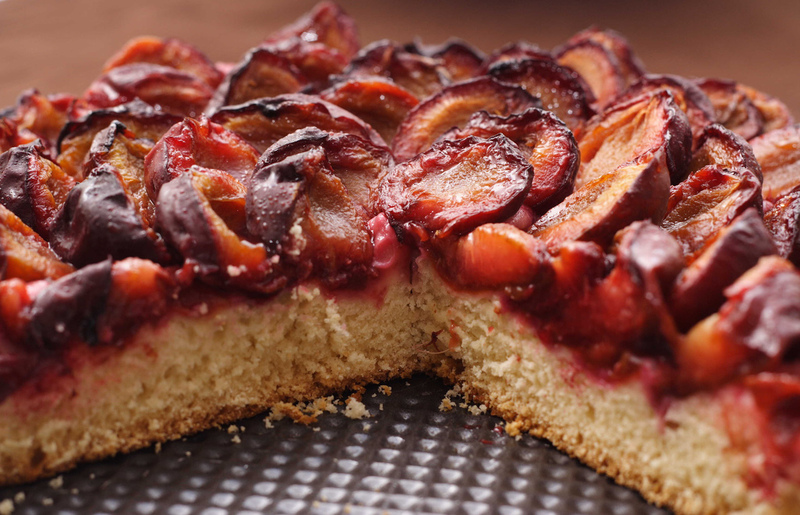 Plums should taste sweet but can also be tart, particularly in the skin. Known to be high in fiber, and thus helping to keep thing moving, plums were named based on the beliefs of a Roman historian and scientist. Pliny the Elder is said to have maintained that the apricot was a kind of plum that originally came from Armenia. Armenians supported the claims noting a 6,000-year-old apricot pit found at an archaeological site. Around my office there’s a tradition this time of year: German Plum Cake. This is headed up annually by the unlikeliest of characters, our friendly tech guy who grew up in Germany and loves to share his family tradition. It’s simple in design but an annual delicious treat. The great news is the cake can be a basic design allowing fruit to be changed seasonally or missed so you and your kids can experiment. Stir together 1 cup of flour and 5 tablespoons of sugar, per a recipe from cooks.com. Then, with your hands, mix a stick of butter into the flour mixture. Add 1 egg yolk. Press the mixture into a baking dish. It will take 2 pounds of plums, pitted and sliced into eight pieces. Those sections should be laid down in a nice pattern on top of the mixture in the baking dish. This can be the traditional lines, but you can also make faces, swirly designs or whatever crazy zigzag designs you can put together. Bake for 20 to 30 minutes. If the plums are hard, cover with aluminum foil for the first 10 minutes. The cake can be served with sugar, ice cream, whip cream, really anything, or simply on its own. Try mixing peaches, apples or pineapples to keep the cake creations new and exciting.